Medical Waste Disposal | OnSite Waste Technologies. Save time, money and resources by converting your regulated medical waste into sterile garbage at the point of generation. Why pay the high cost of third-party disposal services when medical waste disposal can be done right, on-site? risk and environmental impact of medical waste processing and disposal. Our mission is to provide low-cost medical waste disposal services, available to all small quantity generators (SQG) in any location. We are delivering a fixed long-term price; a value proposition that has never been offered before. OnSite has developed a proprietary desktop device for small-scale medical waste processing. A convenient and easy to use product to convert Regulated Medical Waste (RMW) into regular municipal solid waste, processed entirely at the Small Quantity Generators (SQG) facility. MEDICAL WASTE disposal services are cost-intensive with many points of failure. Hauling waste is a very unpredictable economic model for both the buyer and seller. Hauling vendors are burdened with unpredictable service cost increases that get passed along to you, the customer. Unfortunately you are responsible for you’re biomedical waste from cradle-to-grave. Even if you pay 3rd parties to haul it away and dispose of it. Biomedical waste disposal is highly regulated to ensure proper waste treatment and overall safety. Compliance can be a daunting task. Waste incineration has been cited by the EPA as a major contributor to greenhouse gas emissions, not to mention the thousands of trucks required to haul away biomedical waste. Collect, process, and dispose of ALL medical waste, at your facility. you to collect your waste the exact same way you are doing it today. The OnSite collection containers have been designed to fit perfectly in your existing wall mount. With OnSite’s TE-5000, you’re in control. Dispose of your waste when it suits you. The TE-5000 meets all regulatory compliance requirements for proper conversion of RMW to municipal solid waste. RMW processed on-site can be disposed as regular garbage, eliminating any additional charges or disposal requirements. 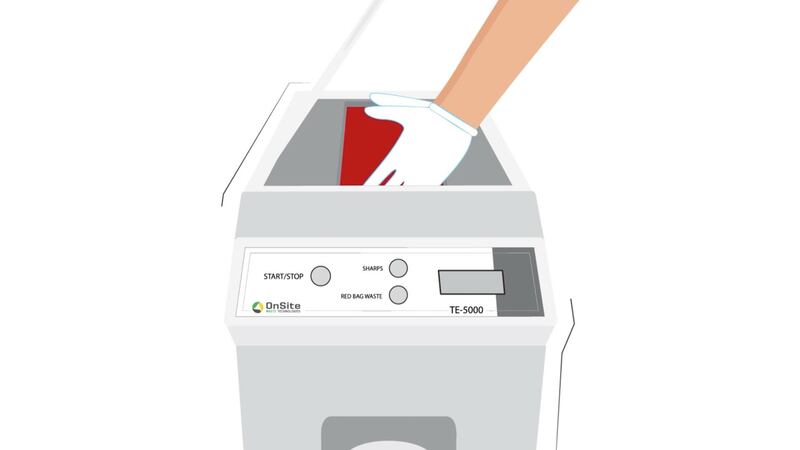 The TE-5000 is the best medical waste disposal option that converts regulated medical waste into sterile garbage at your own premises. The TE-5000 is designed to exceed the most excruciating standards from all state, federal, and local regulations for the safe handling and disposal of Regulated Medical Waste. The TE-5000’s technology has been reviewed by over 75 different regulatory authorities, with a 100% approval rating. designed using the latest technology, our system controls maximize user safety. Processing takes 2.5 hours – enabling multiple cycles per day. Produces little to no noxious emissions or odor even when operated in a small room (verified by efficacy testing). Utilizes a single-use, one gallon waste collection container with each load. The TE-5000 stores all your compliance data when you run a process cycle - no need to wait for your paperwork, you always have a back up. Meets all regulatory compliance requirements for proper conversion of RMW to municipal solid waste on-site at customer facilities. Lease a TE-5000 for a fixed monthly cost. Add as many processing containers you need. We’ll make sure you’re OSHA compliant. We are based in the US and offer our approved machine in 48 states with New York and New Jersey coming soon. Whether you’re a small dental practice or a large nursing home, the cost of regulated medical waste disposal can add up. Here’s a snapshot of some of the markets we service. Copyright © 2018 OnSite Waste Technologies, Inc. All Rights Reserved.